Dreaming of a mattress that offers a best-of-both-worlds feel? Why dream when this can be a reality? Enter our mattress giveaway today for your chance to win a brand new Sleeping Duck mattress! This hybrid mattress could make your dreams come true. We’re giving away one (1) brand new Sleeping Duck mattress. The Sleeping Duck is a hybrid mattress combining layers of memory foam, latex foam, and pocketed coils. One (1) grand prize winner will be randomly selected and win one (1) new Sleeping Duck mattress in their preferred size (Single, Double, European Double, King, European King, Super King). Duration: The giveaway starts today, 06/30/17 and ends 07/15/17 at 11:59 PM PST. Grand Prize: One (1) grand prize winner will be randomly chosen based on the pool of entries. The winner will win one (1) Sleeping Duck mattress in their preferred size. Sponsor: Giveaway prize is provided by Sleeping Duck. Sleeping Duck will mail all prizes directly to the winner. Giveaway sponsors may contact you via email. If you do not wish to receive these email communications you may opt out via the unsubscribe link included within those email communications. This giveaway would not be possible without the generosity of our incredible sponsors. Thank you Sleeping Duck for so kindly donating a mattress for this giveaway! Thank you for giving me the chance to win such a fab hybrid mattress. My 23yr old son soooo needs a new mattress, this would be ideal and just in time for his birthday at the end of august ! Guaranteed to help you lie in. Looks sumptious. How funny, I actually need a new mattress as the current one is like sleeping in a whole. Would love to be in the chance to win this fantastic prize! Thanks. My Mattress is 10 years old, would love to get a new Sleeping Duck Mattress – they are the best. I could definitely do with a new mattress pretty please… My bad back would be forever in your debt! As this is a top rated mattress to win won would a real result. 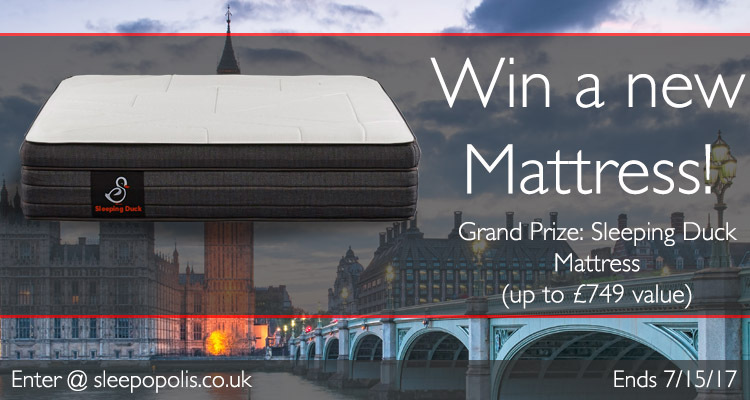 What a great prize to win – not just for a fantastic mattress but a whole new way of sleeping!